Growing up white trash without a lot of money, I always looked forward to the special treat of eating at Olive Garden. Mainly for the classy, high-dollar ambiance but also the SALAD…Now, as an adult that occasionally still gets excited about a ‘Tour of Italy,’ salads don’t do a whole lot for me. But in an effort to make a healthy side, with mostly seasonal ingredients, this dish was born. Also, for me, eating radishes is what I imagine snacking on crunchy but somehow wet dirt is like. 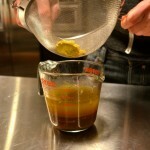 So, second to deep-frying, I turned to my second favorite food transformation process: pickling. These little things elevate this salad to OG status. Also while making this dish, we learned a new trick that has changed every salad we will ever make. Toss all ingredients together in a large bowl and dress it to taste. Serve immediately. 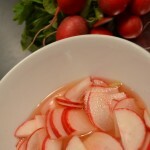 Mix all ingredients except radishes in a nonreactive bowl and stir in radishes. Allow to sit, uncovered at room temperature for 45 minutes to an hour. Stirring every 20 minutes or so. Drain and serve. Place all ingredients other than egg yolk into a large bowl. 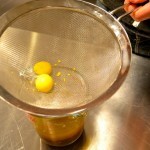 Using the back of a large spoon, press egg yolk through a sieve into liquid, then whisk to combine. 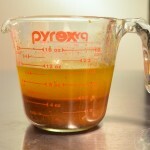 The yolk acts as an emulsifier and prevent the dressing from separating without changing the flavor of your vinaigrette. 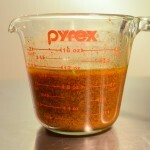 Can be made up to a day ahead and kept refrigerated.